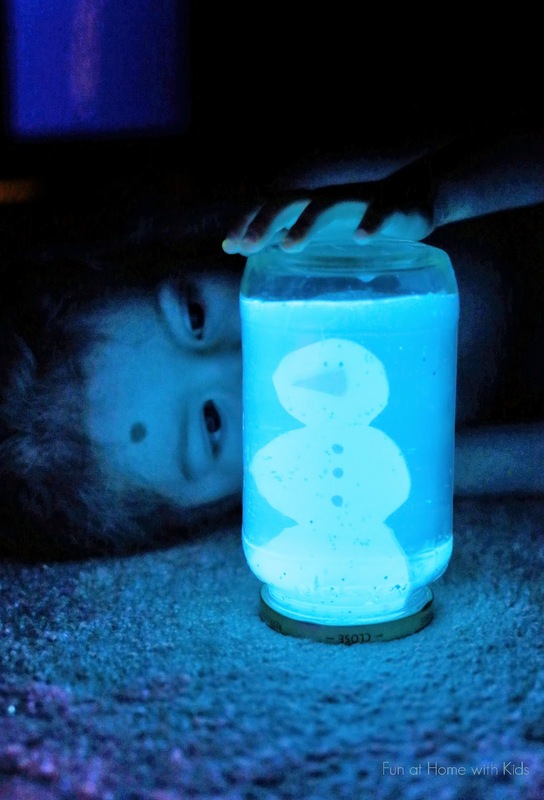 Glow in the dark crafts are not just for Halloween. There are so many possibilities for your projects to glow – and we’ve rounded up our favorites. 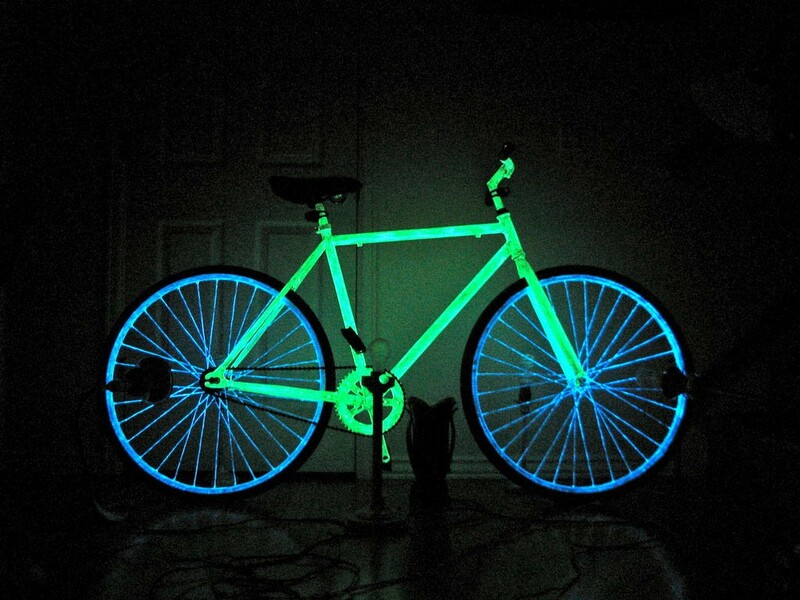 These glow in the dark ideas will allow you to have the best glowstick party ever. 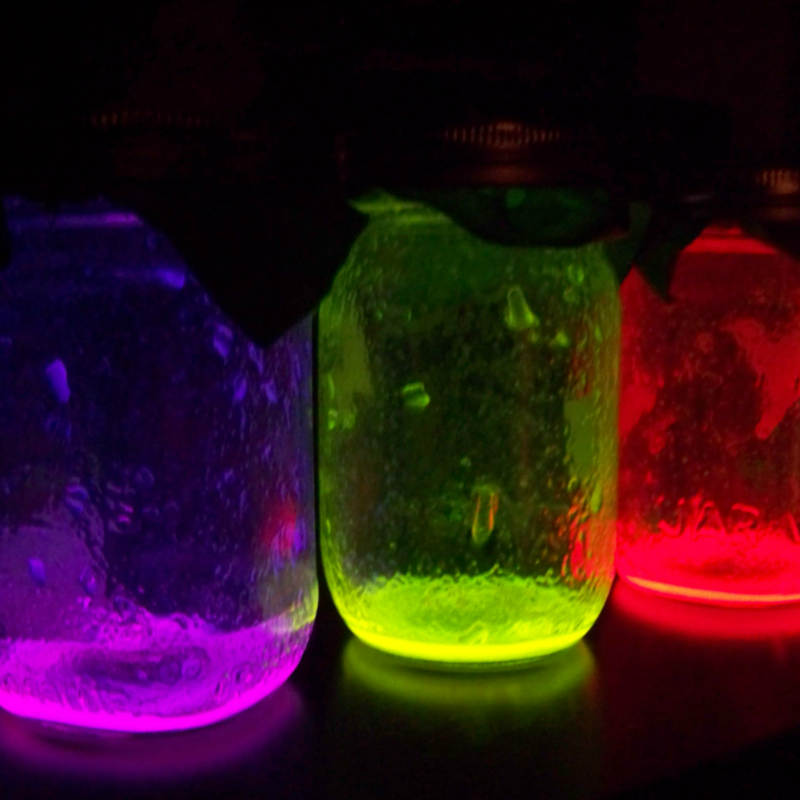 Plus, glow in the dark crafts for kids are always fun and sometimes educational. I love to see the look on a child’s face after playing with glow in the dark play dough and watching them enjoy the little things in life. Glow crafts can be so mesmerizing and now I just want to know all of the things that glow in blacklight so I can throw a party myself! Because I’m totally hip and cool, right? 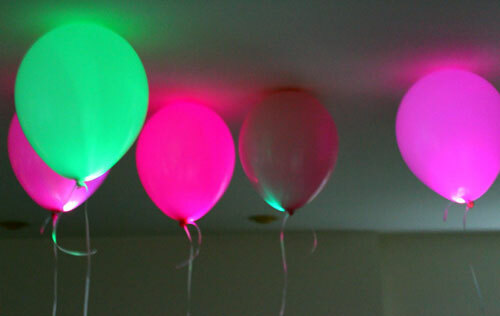 Glow in the dark ideas don’t have to be for parties. You can make your own glow in the dark flowers (WHAT) and even a table?! The possibilities are endless for us crafters – both young and old. First, our Facebook fans fell in love with this glow in the dark table. Seems too good to be true, but this table has full instructions for how to make your own. For free. 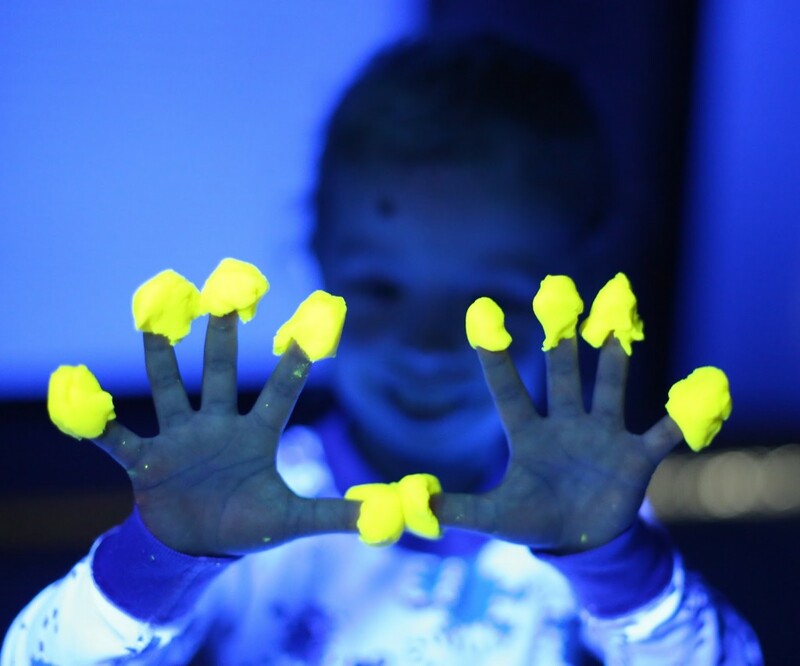 With the help of a blacklight, you man make your own glow-in-the dark play dough which looks like so much fun! 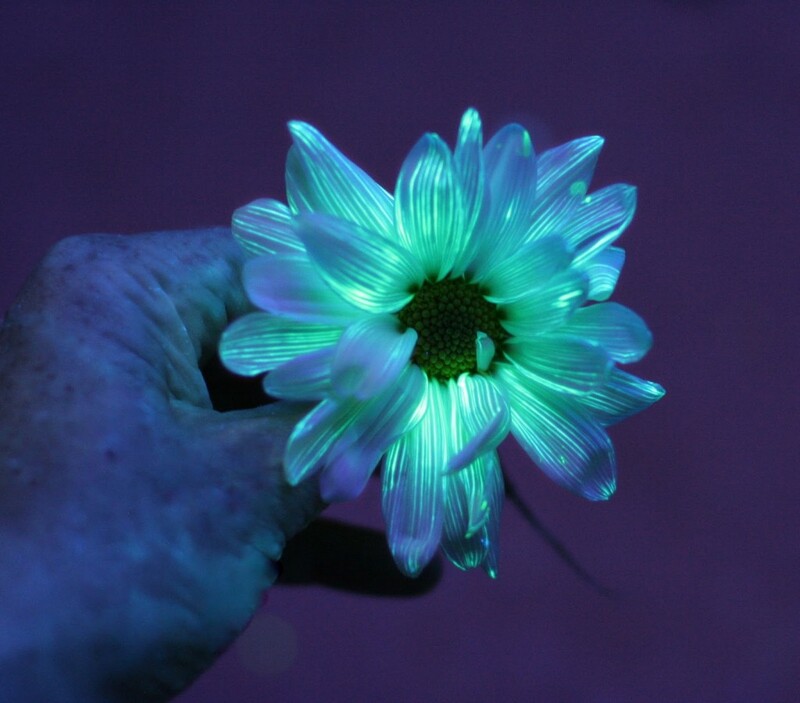 Yes, these glow in the dark flowers are real. And yes, you can make them yourself. 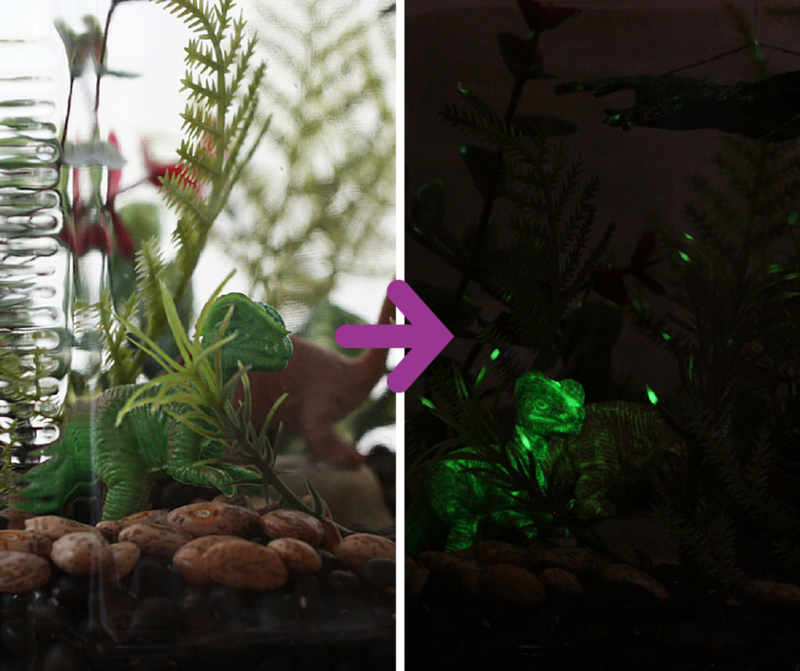 Make your trendy terrarium a glowing dinosaur exhibit. 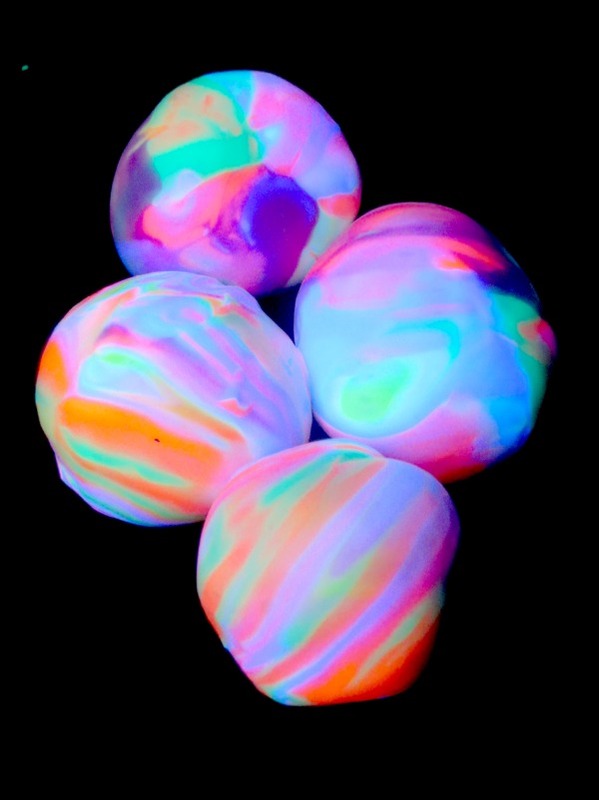 No paint or glow sticks involved, these balloons are still the most glow-tastic balloons we’ve ever seen. Snow globes aren’t just for snow anymore my friends. Glowing snowmen are the best! Let it glow. Want a totally awesome bike and feel like a superhero? This bike makeover is for you. These bouncy balls are the epitome of fun. You can’t go wrong with mason jars. These would make the best centerpieces at your next party. Which glow in the dark idea do you want to try first? I’m someone who loves to decorate for a party of any kind, but with a small budget, I can’t always find what I’m looking for at party stores. If you’re like me, then you know there’s an easy solution; crafting! 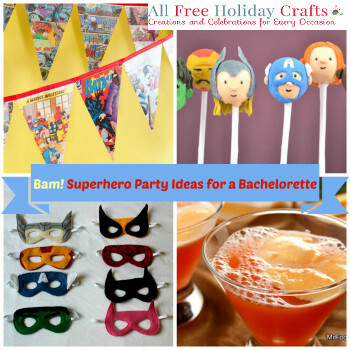 The editors here at AllFreeHolidayCrafts.com want to help you throw the best party possible, so we’ve put together some of our favorite crafts that we’re sure will have everyone celebrating. 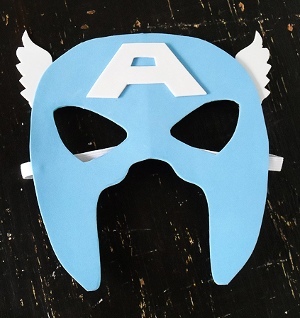 Our party crafts cover everything from decorations to party favors so your guests are sure to have a good time from start to finish. Bright and Colorful Gumdrop Wreath – Get your guests in good spirits before they even walk in the door by greeting them with this delicious-looking candy wreath. 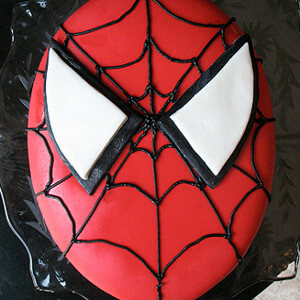 Though it’s not edible, it’s a creative alternative to ribbons and balloons. This sweet design is something that party-goers of all ages can enjoy. Confetti Vases and Jars – While waiting for everyone to arrive, show your guests these artistic glass crafts made from recyclable goods. 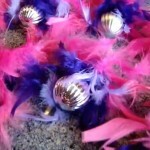 The vibrant colors inspire the right energy while the size makes them easy to fit in with your other party decorations. 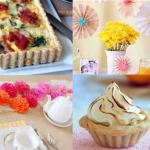 They’re also a versatile craft that you can use for a lovely bouquet of flowers or as a festive holder for utensils. Chic DIY Centerpiece – This retro-inspired craft is a hit on our page, so we’re bringing it to you. If you’re looking for a way to keep your guests conversing around the food table, all you’ll need is one of these stylish centerpieces. Each centerpiece is made entirely of old material that you can redesign with your own personal artistic touches. No matter what theme you’re going for, your guests are sure to eat this centerpiece up! Colorful Beaded Napkin Rings – Wow your guests with the detail in your crafting with intricately decorated napkin rings. They’re a sturdy, yet chic way to keep your table settings organized, and you’ll be able to paint them according to any theme you can think of. Whether it’s Halloween or Christmas, these beaded napkins will brighten up your table. Lovely Lace Gift Bags – Don’t let your guests leave without one final crafty treat! It’s impossible for them to forget their gift bags when they look as elegant as these. Using only a few cheap dollar store materials, you’ll have made personalized gift bags that show your guests how much you appreciate them coming. They’re big enough to hold food and gifts, and they’re simple enough to use at a number of events. 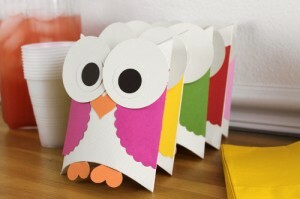 This is just the beginning of your party craft adventure, because the staff at AllFreeHolidayCrafts.com is always looking for more new and exciting ways to add DIY elements to every party situation. If you’re looking for more free party ideas, just head over to our site. What’s the biggest must-have at your parties? We’re looking for ideas, so please comment below. Tomorrow is Cinco de Mayo and though I’m not especially fond of pinatas and sombreros, I am a huge fan of parties. In my mind you don’t need to have a specific reason to throw a party for your friends and family. Just getting together to have some food and drinks, some laughs and some good times is reason enough! Get free, downloadable ice-cream themed invitations and thank you cards from One Charming Party. 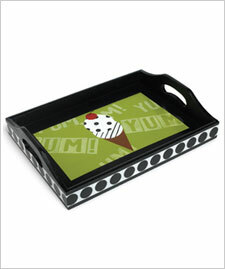 Create a cute decorative tray to serve up your cool treats! 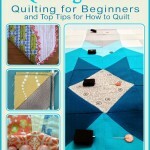 This tutorial from Plaid shows you how. Make each of your guests their own Ice Cream Cone Headband so you can all celebrate in style! It wouldn’t be the movies without a concession stand, so find out how to create your own with this guide from The TomKat Studio. 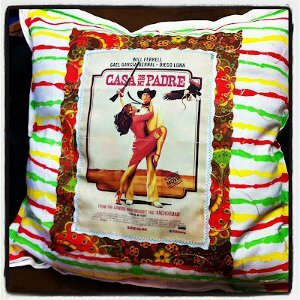 Here’s a fun idea to fit into your movie night theme: Have guests create their own movie poster pillows using images from their favorite films! Send your guests home with these adorable party favors so they can continue the movie watching at home! Get the details from Jacolyn Murphy. Welcome your guests with a colorful tissue wreath that has all the colors of the rainbow! 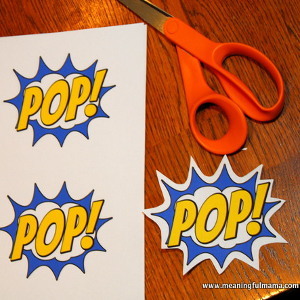 This easy-to-make door decoration is just the thing to get the party started! Dress up your snack table with a fun and ruffly rainbow table skirt! This one from Backless Shirt can be made for under ten bucks! Don’t forget your guests are going to want to “taste the rainbow” at your rainbow-themed bash, so serve up these cute cupcakes to make the theme complete! These are just a few of the awesome party themes I found while searching online. You can find tons more on our website or on Pinterest. Happy planning and happy celebrating! Also don’t forget about Crafty Fiesta week! 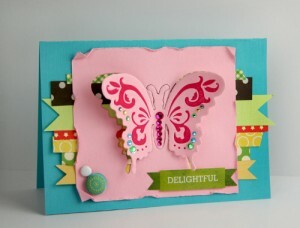 Today we’re celebrating with another tutorial and giveaway from our friends at I Love to Create! Read our blog post here to find out how you can win a fabulous prize! Now tell me: What kinds of parties do YOU have planned this summer? 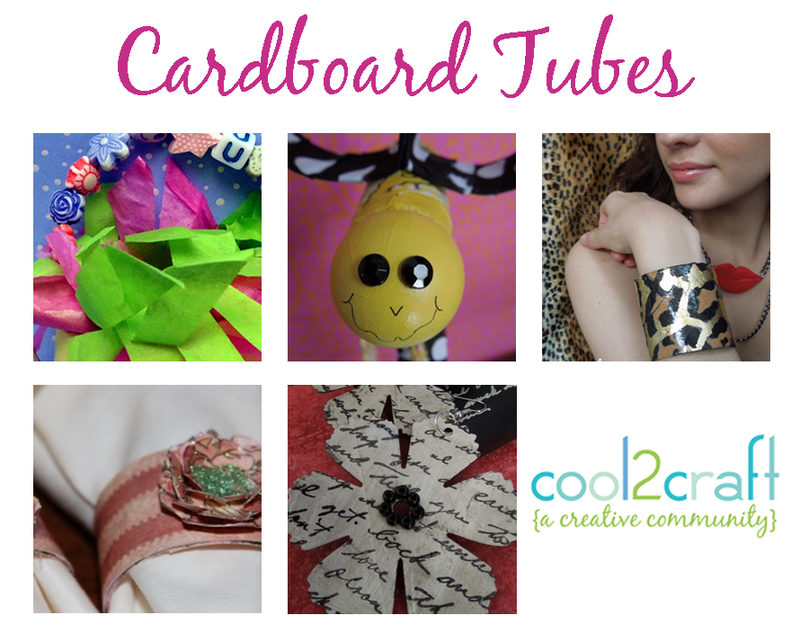 It’s a Crafty Fiesta all week long here on the FaveCrafts blog, and we’re joined by I Love to Create to get you geared up for Cinco de Mayo with some fun and festive craft projects! Be sure to keep tuning in every day through May 6th for all our amazing Cinco de Mayo craft ideas, DIY inspiration, and a giveaway each day. Check out today’s colorful chip and dip bowl tutorial, and then be sure to scroll down to enter our giveaway below! It wouldn’t be a fiesta without some tortilla chips and salsa! Spice up your snack table with this easy chili-pepper-painted Fiesta Chip and Dip Bowl project from I Love to Create! In bold reds, yellows, and greens, this bright and beautiful bowl is a simple way to turn up the volume on your party decor. You’ll actually want your snacks to run out so that you can show off your handiwork to all your fiesta guests! Trace design on plate with clay carbon and pencil. Dampen No. 8 Round brush with water; then condition with Brush Cleaner and press out excess. Load brush with Mask ‘n Peel and apply one good coat to chili peppers. Allow to dry thoroughly. Use No. 10 Round brush to create vertical stripes with three coats of Neon Red, Neon Yellow, and Neon Green. Let dry between coats. While the last coat is still slightly damp, lift corner of each masked area with a straight pin and gently pull mask off. Check for and remove any remaining particles. Use No. 8 Round brush to apply three coats of Neon Orange, Neon Yellow, and Neon Green to chili peppers. Also apply three coats of Bright Kiwi to stems. Create highlights with opposite colors. Let dry after each coat. Use No. 6 Fan Glaze to apply three coats of Neon Yellow to dip center of bowl. Let dry after each coat. Use No. 10 Round brush to apply three coats of Dark Black to rim of dip center and around rim of bowl. Use No. 6 Fan Glaze brush to apply three coats to back of bowl. Let dry after each coat. Use No. 1 Liner brush to outline peppers and stripes with Dark Black. Also add light detail lines on each pepper. Let dry. Apply one coat of Clear glaze completely on bowl with No. 6 Fan Glaze brush. Let dry. Stilt and glaze fire to shelf cone 06. It wouldn’t be a celebration without a chance to win something! We’re giving away a Crafty Chica Charm Bracelet Kit from iLovetoCreate! 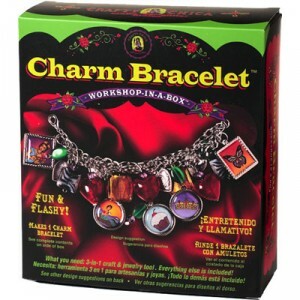 Charm bracelets are great because you can have a reminder of all your favorite things with you in one place at all times! This kit makes it easy to put together a special and fun charm bracelet, so answer the question below to be entered for a chance to win! 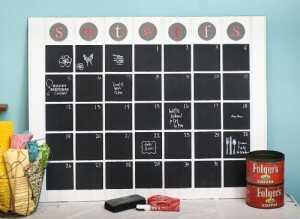 Contest closes May 4, 2012 at 11:59p CST. I can never seem to get enough Mexican food in my diet (and by “food” I mean “margaritas”). I’m also obsessed with colorful crafts, streamers, fringey banners, and everything else that just screams Cinco de Mayo. Luckily for me, and anyone else who shares my love of guacamole and fiesta crafts, Cinco de Mayo is right around the corner. Will you be celebrating this year? 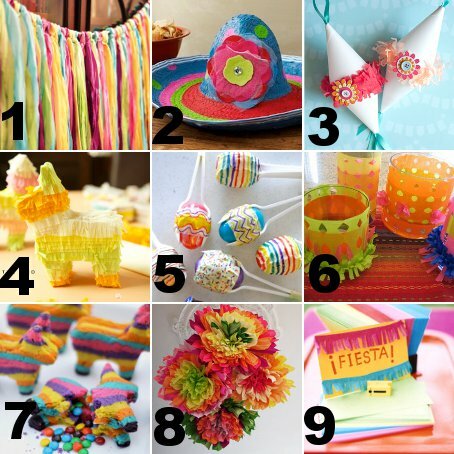 If you’re throwing a fiesta, check out some of these colorful, cheerful crafts for Cinco de Mayo.